Generator London i London, England: Reservér nu! 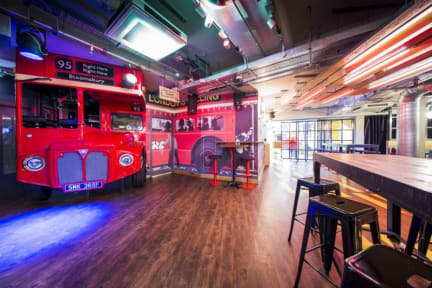 Oversat af Hostelworld gæster har sagt Generator Hostel London er en ren, sikker, "velorganiseret hostel med god og professionelle personale«. Vi kan godt lide deres "livlig og atmosfæriske 'bar, som rejsende fortæller os er" et godt sted at hænge ud en smule, og har en øl mens møde nice mennesker fra hele verden «. Vores brugere siger dette hostel er "kun tre minutters gang til Russell [square] metrostationen seks minutter til Kings Cross Station [og] tre minutter til at busser«. I stayed at this hostel 10 years ago, and there has really been an upgrade since then. 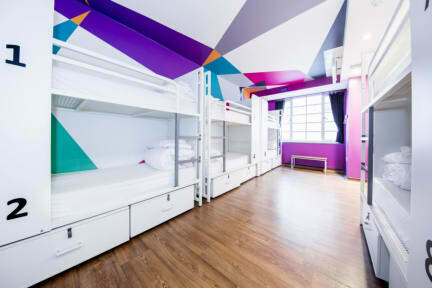 The hostel is clean, modern and has everything you need for making your stay in london comfortable. Theres is a lovely atmosphere in the area that the hostel is located. A lot of cafees and restaurant + its really close to the underground station, Russel Square Station. There is bo kitchen no bedside lamp or power plugs. It is situated on top of the underground train so you can constantly hear the train driving under you. It looks super cool but lacks basic facilities. The showers are not nice either, they are small stalls with no space for clothing and at peak shower times the entire, very big, toilet and shower room gets wet.